Charles Edmund Brock (5 February 1870 – 28 February 1938) was a widely published English painter, line artist and book illustrator, who signed most of his work C. E. Brock. He was the eldest of four artist brothers, including Henry Matthew Brock, also an illustrator. Brock was born on 5 February 1870 in Holloway, London. The family later settled in Cambridge. He studied art briefly under sculptor Henry Wiles. Brock received his first book commission at the age of 20 in 1890. 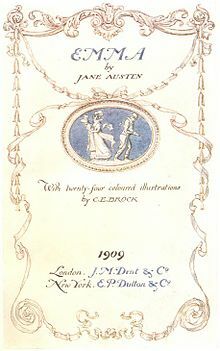 He became very successful, and illustrated books for authors such as Jonathan Swift, William Thackeray, Jane Austen, Charles Dickens, and George Eliot. Brock also contributed pieces to several magazines such as The Quiver, The Strand, and Pearsons. He used the Cambridge college libraries for his "picture research." In illustration Brock is best known for his line work, initially working in the tradition of Hugh Thomson, but he was also a skilled colourist. As a painter he received plaudits for his realism and vibrancy he created in his work. Only a small quantity of his paintings have been located which is why their prices have been so high. Brock and his brothers maintained a Cambridge studio filled with various curios, antiques, furniture, and a costume collection. They owned a large collection of Regency era costume prints and fashion plates, and had clothes specially made as examples for certain costumes. Using these, family members modeled for each other. Unequivocally the most famous and valuable paintings in Brock's career were his golf paintings – The Bunker; The Drive; and The Putt – all of which were painted in 1894 as part of the same series. These paintings were acquired together by a Japanese collector in 1991 for $1.5 million. The most valuable of these is The Putt, which was repainted due to the position of the caddy and bystander as the commissioner of the painting wanted to bring himself, the putter, more into the forefront of the painting. The initial unsigned painting is considered to be the more impressive of the two versions, and is even used as the print for postcards and posters sold in many golf museums. Brock did not publish any more work after 1910. He died on 28 February 1938 in Cambridge. The approach of C.E. Brock's work varied with the sort of story he was illustrating. Some was refined and described as "sensitive to the delicate, teacup-and-saucer primness and feminine outlook of the early Victorian novelists," while other work was "appreciative of the healthy, boisterous, thoroughly English characters" – soldiers, rustics, and "horsey types." Other illustrations were grotesqueries drawn to amuse children looking at or reading storybooks. ^ a b c d Houfe, Simon (1981). The Dictionary of British Book Illustrators and Caricaturists, 1800–1914. Suffolk: Antique Collectors' Club Ltd. pp. 195–196. ISBN 0902028731. ^ Golfiana, Magazine (1991). "Golfiana Magazine". Golfiana Magazine. 3 (4). Wikimedia Commons has media related to C. E. Brock. Illustrations for The Heroes of Asgard, by Annie and Eliza Keary, 1930. This page was last edited on 4 February 2019, at 19:33 (UTC).